Prague, Vienna and Budapest are often grouped together by travellers. Three cities within great distance of each other, all with much to offer its visitors. But what about Slovakia's capital, Bratislava? It fits into the loop equally as well as its neighbours, and is located roughly an hour away from the Austrian capital. Yet, it's often not even considered by travellers. Here's why that shouldn't be the case. I took a day trip to Bratislava from Brno, where I'm currently studying abroad for the semester, and in all honesty, I wasn't expecting much. I'd never heard anyone rave about how much they loved the city, and there's definitely some negative reviews out there. When my bus pulled up to an area where all I could see was grey and cranes, I thought I understood why. What was I doing here? However, google maps told me I wasn't far away from the city centre so I followed the route. The more I walked, the happier I became - I was quickly charmed by this cheerful little city. You know when you step into a setting it just feels bright? The streets certainly weren't the most colourful I'd seen but they still seemed to seep with colour. During the day it started to rain, but I was still so happy to be outside soaking up Bratislava's character. There was a lovely energy about that was contagious. There were quite a lot of tourists but they didn't crowd the path - nothing like the sometimes frustrating touristy energy of Prague. Here's the thing: no, Bratislava can't be compared to Vienna or Prague. It's not grand or polished, nor does it pretend to be. The streets are weathered and there's nothing spectacular about its sights. However, it's warm and inviting, which is particularly welcomed by solo travellers. The city is young and fun and beautiful in its own way. It shouldn't be compared to its popular neighbours, but it should be appreciated in its own right, for the endearing city that it is. One of my favourite things about Bratislava is how easy it is to walk around on foot, due to the small size of the city. I love not having to waste time figuring out public transport when I go somewhere, and I think there's something so freeing about walking as much as possible, seeing as many tiny corners of a place as I can. The castle (pictured above) is a great place to start your day, where you can find a great view of the river. 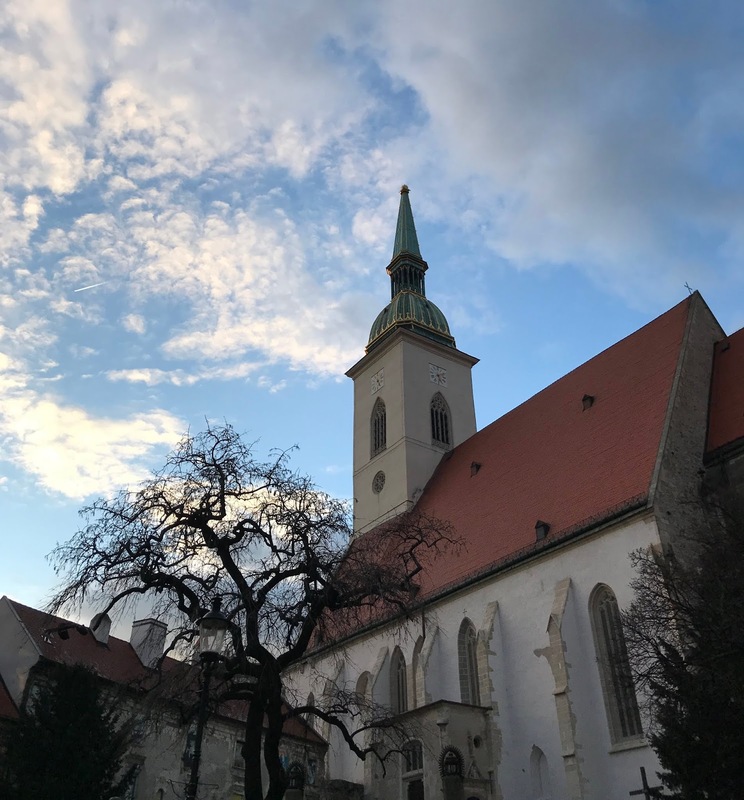 There's also many great food options all around Bratislava - you can enjoy exploring the city's streets until you see a menu that takes your fancy. I ordered the house burger in one restaurant I sat down at, not having any idea what was actually in it due to the lack of an English translation. It ended up being one of the greatest burgers I've ever ordered, no exaggeration! The UFO is the popular viewing platform in Bratislava, and you walk across a bridge to get to it. I did so at sunset and it was lovely. The UFO itself is pretty cheap, especially with a student card, and you can see the city's sights from inside through the glass, or go up some (kind of scary) stairs. If you pick a windy day like I did on 1st March, you'll be laughing. I really loved watching the sun set over Bratislava though, especially after a day of becoming acquainted with it, and growing to like it so much. If you go to the toilets up there, you'll even get a view from inside there too. I was a little startled to see such big windows as I went to pee from so high up!